Stage 17 of the Vuelta a España was always going to be big for riders looking to move up the GC or to jump in the breakaway and steal the show. 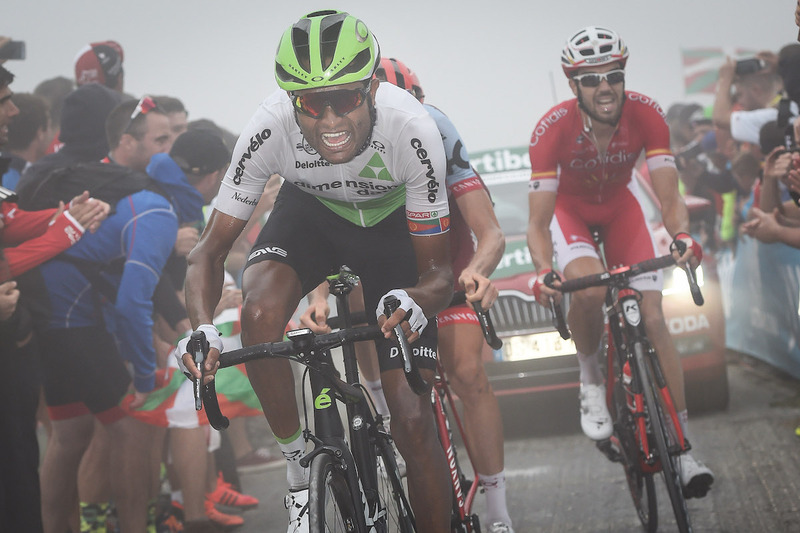 The main goal for Team Dimension Data for Qhubeka, however, was simply to get Ben King into the breakaway. King was sitting in third position in the KOM Classification at the start of the day, only one point behind second position and eight points behind the leader. The hope was to score as many mountain points as possible to try and wear the Polka Dot jersey by the end of the day. King tried numerous times to get into the break with no success, but the team managed to get Merhawi Kudus and Amanuel Gebreigzabhier, two Eritrean riders, across the gap. Gebreigzabhier, just 24 years old, was riding in his first grand tour—but it didn’t show. The course covered six officially categorized climbs, but (in true Vuelta fashion) there were many more testing climbs that in their own right could be considered categorized climbs as well. Gebreigzabhier finished the 155km course in 4 hours 10 minutes, a mere 48s behind eventual winner Michael Woods (Team EF Education First-Drapac p/b Cannondale). Over 3343m of climbing, Gebreigzbhier averaged an impressive 292W, with a normalized power of 333W. That’s a staggering 5W/kg for 4hrs of racing with an average speed of 37kph. The day’s break would be formed on the first categorized climb of the day; 6.7km averaging 5% and topping out at kilometer 16.7. The race was in full swing at this point, and Gebreigzabhier had to put in a massive effort of 422W (6.3W/kg) with an average speed of 28kph in order to make the break, which included many elite climbers. The breakaway managed to hit the final climb of the race with an advantage of a little over 4 minutes over the peloton. Gebreigzabhier managed to average 393W for this final climb which, at his finishing weight, would give him a power-to-weight ratio of 5.8W/kg. The race really started to explode within the final 3.8km of the climb, where the gradients peaked above 20% in some places and averaged 12.5%. When starting this final 4km, the breakaway’s advantage was brought down to three minutes, and it was at two kilometers to go that Gebreigzabhier lost contact with the three riders who would contest for the stage win. The 24-year-old ultimately finished 7th, an outstanding result in the company of so many World Class riders on the biggest stage in professional cycling. It’s even more impressive considering that this was was Gebreigzabhier’s maiden Grand Tour, and his first since moving to Dimension Data for Qhubeka’s World Tour Team. This is what Gebreigzabhier had to say: “The final climb was steep and hard, but my legs were feeling ok, so I am very happy with my ride today. It is my first grand tour, so I didn’t really know what to expect. I was just trying to do my best. Today’s result has given me a lot of confidence, I am very happy for the team to give me this opportunity and grateful to Merhawi for his help in the breakaway.” It’s an auspicious start for this young talent from Africa. Trevor Court is a Performance Coach at Team Dimension Data for Qhubeka. He has been living in Italy and has helped develop young riders from competing at low-level races to the World's biggest races. Trevor has been with the team since 2011. You can follow him on Twitter at @Trevor_Court and Team Dimension Data at @TeamDiData.